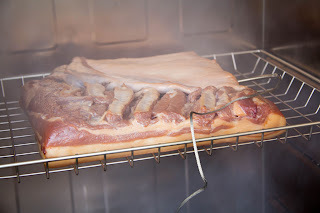 Followers of this blog know that I recently got myself a smoker and set out on the path of curing and smoking my own bacon. This is part two of that story, for those of you that didn't read part one - have a look here to get in the mood for this riveting and fascinating story. Or something like that. Where the last part left of was with the belly of pork curing in the fridge. This being my first attempt I was worrying quite a bit about the progress etc. 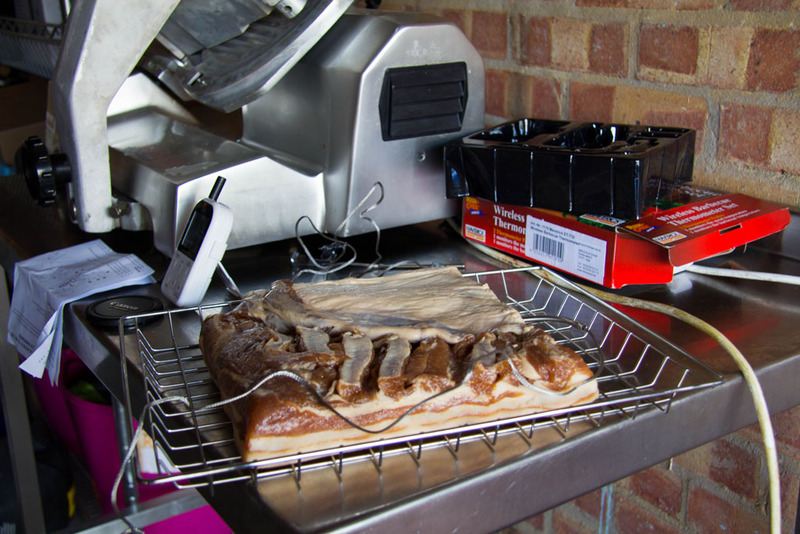 Some more knowledgeable and experienced bacon makers over at the Bradley Smoker Forum soon calmed me and the experiment continued on. 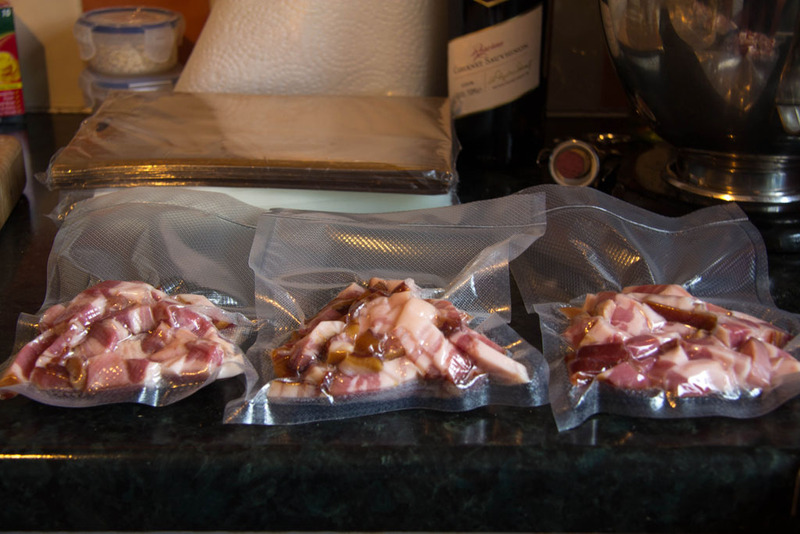 Due to some external circumstances that I couldn't do much about, apparently friends weddings are more important than my homemade bacon, I left the bacon curing for 10 days. 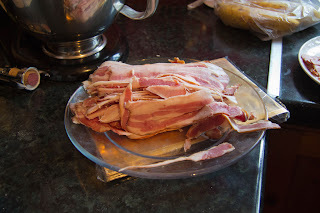 Once I was back from the wedding the bacon was rinsed and air-dried in the fridge over night. 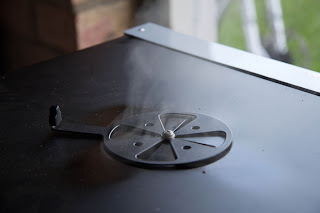 The next day the smoker was heated up to 49C/120F and the maple smoke started rolling. I kept it as this temperature with smoke rolling for two hours. Once the time was up I increased the temperature to 71C/160F and started waiting for the internal temperature of the bacon to reach 65C/150F. And I waited. And waited. And waited. The fact that is was really cold out probably didn't help but the wait was quite long and certain interested parties lost interest and stamina long before the remote temperature monitor gave up the releasing beep that indicated that we'd reached the correct temperature. 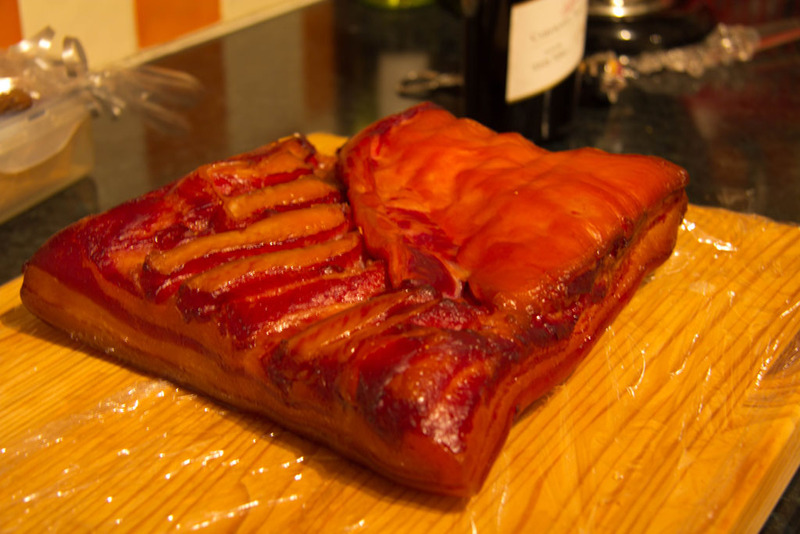 I removed the bacon from the smoker and let it cool down before cling filming it and leaving it in the fridge over night to firm up a bit. The next day I got it out of the fridge and headed out in the garage to try my meat slicer for the first time. You have no idea how wide my smile was when the first slice hit the plate. I'm not exaggerating when I say that it was one of the happiest and proudest moments of my adventures in cooking. I sliced and vacuum packed the majority of the belly and diced the last bit into lardons that also got vacuum packed and frozen for future use. At the same time as the slicing was going on I was making rolls for the bacon butties I thought we had deserved. The recipe for those will have to wait another couple of days though. So, some questions that I guess some of you might have. Was it worth it? - Hell yeah! Would you do it again? - Hell yeah, already thinking of other cures that might work. Did it taste ok? - Hell yeah, really nice and sweet flavour. 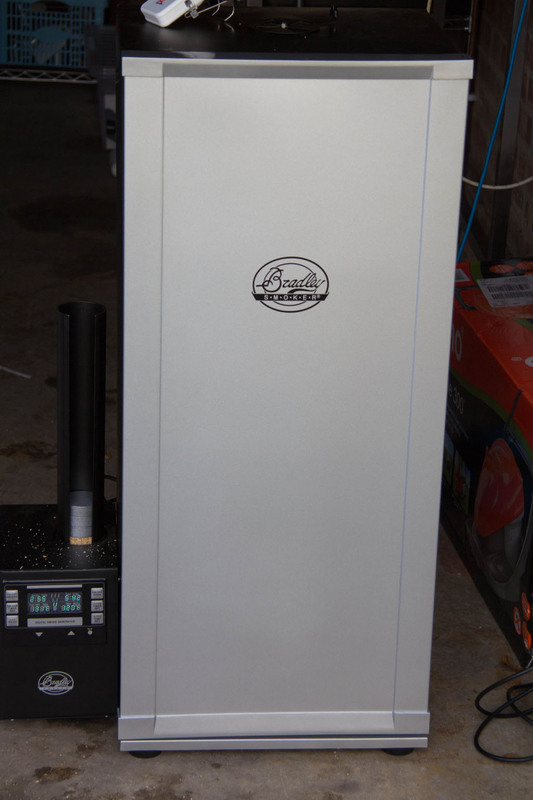 what a great idea,I love your commitment, hmm I wonder if Mrs Bunny Chow will let me buy a smoker? I'm not sure if it is commitment, stubbornness or just plain stupidity but I do like projects like this. Sausage making is next on the list. I sure will, thanks again for taking the time to post a comment. 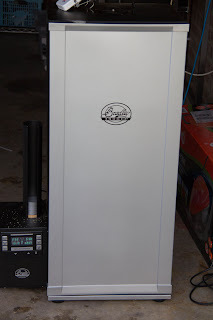 And that's a lovely-looking smoker you've got there. Quite envious! I hope that will happen. There are lots of arts and species that will be forgotten if we don't. The economic downturn will probably lead people to try and make a lot more of their own food as well. The cheap food is just not as good as what you can make on your own, quite often at a lesser cost too. I'm not sure how far ahead of the curve I am, it feels like there's quite a large movement just behind me. Thank you - I'm quite proud of it. I've wanted one for years but living on the second floor with just a balcony to put it on put hampers on that. Now that I live in a house with a garage I could finally realise this dream too. Thanks for taking the time to post a comment. It is really appreciated. Bless you Mike ! You don't suffer from bromance, you suffer from the more serious condition 'smomance' :). I'm glad you do though, the bacon was the best I've had and being from Denmark, that says a lot ! Coming from a Dane that is high praise indeed. Many thanks for the kind words and taking the time to post a comment - that is what makes this worth doing and the experimentation continuing. You know, I keep meaning to make bacon but I've always chickened out... maybe I should just DO IT?! I think just doing it is the way forward. I have to admit that it was a bit nerve wrecking being the first time. I was wondering if it was curing ok, if it had had enough time etc. In the end though - it cooked beautifully and the taste (even if I say so myself ;) ) was great. 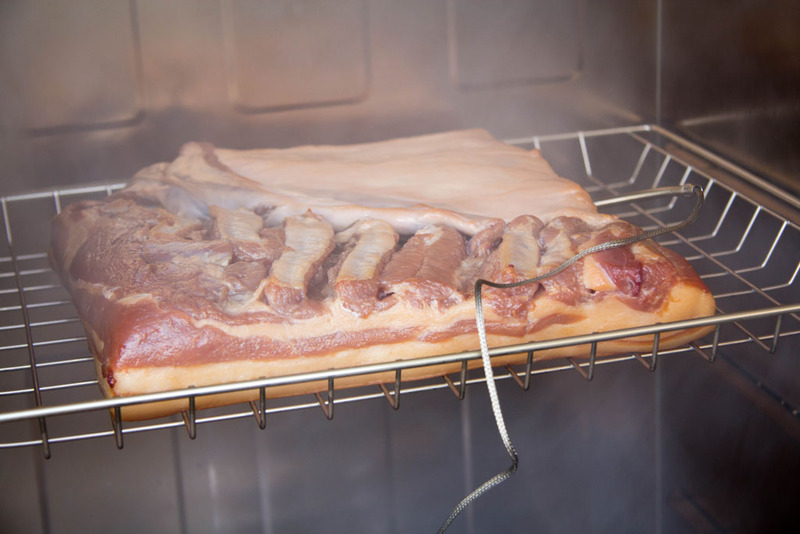 If you don't have access to a smoker I'm sure you can just cook it in a low oven instead. I've seen some people put liquid smoke in the cure - not sure about that myself though. Give it a go - would love to read about your endeavors on your blog. You are an inspiration Mike. You're living my dream!